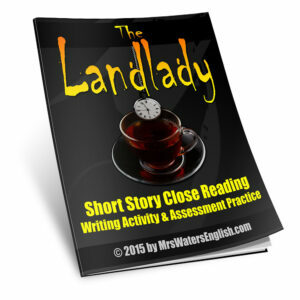 Roald Dahl’s short story “The Landlady” is a deliciously creepy tale that is sure to enthrall even the most jaded middle school student. With Halloween only a month and a half away, now is the time to start planning a unit that’s guaranteed to keep your kids on the edges of their seats, but will also help them practice for upcoming state assessments. Not only can you download the short story here, but I’ve also written a student assessment practice unit that will help you start preparing your students for their test, even as they enjoy the story.